There are two main criminal laws that address the treatment of animals in Maryland, with one being misdemeanor and the other a felony. Each of these two laws require that the state prove certain elements, but often police officers that are called to investigate an alleged crime are not aware of these exact elements. Therefore most cases start out as a felony arrest for aggravated cruelty to animals, which is the more serious crime. In our experience we have learned that when officers are in doubt about which crime to charge, they often err on the side of the more serious one. In addition the animal control officers will not hesitate to take possession of your dog, cat or other pet and hold them without providing any type of explanation. In some cases the city or county can keep your pet indefinitely and will rarely provide any information about the status of your beloved animal. These crimes often carry a certain stigma, and defendants may feel as if the odds are stacked against them more so than common crimes such as robbery or burglary. Because of the way people generally feel about animals in this country, cruelty defendants are often treated harsher than a defendant who harms another human being. This is just the reality of this crime, but a criminal defense lawyer at The Herbst Firm will never let these stigmas result in an unjust resolution for any client. Benjamin Herbst has experience defending cases involving mistreatment of animals and is prepared to defend you or a loved one at all costs. To prove a case for aggravated cruelty to animals, the state must show that the defendant intentionally beat, tortured, mutilated, or killed an animal. This crime also includes a provision that is designed to protect police K9 units. Anyone who inflicts bodily harm on a police dog will likely be charged with felony cruelty. There are certain defenses to this charge, the most obvious being self defense. 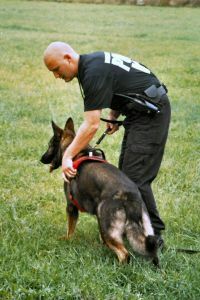 Anyone who is attacked by an animal clearly has a right to defend him or herself, but the self defense argument becomes more complex when a police K9 is involved because cops will almost always say that the defendant was never in danger. This argument is often a complete fabrication on the part of police, as their dogs can be extremely vicious when sent in attack mode. Anyone charged with aggravated cruelty faces a felony conviction with up to 3 years in jail and a $5,000 fine. Although it is a felony, the district court has original jurisdiction over this charge, which means the case will not automatically go to the circuit court. The misdemeanor version of animal cruelty is legally defined as abuse or neglect of an animal. This charge carries a maximum jail sentence of 90 days and a $1,000 fine, which means the defendant will not be entitled to a jury trial. Possible acts that could constitute this offense include overloading or overdriving an animal, depriving an animal of necessary sustenance, or inflicting unnecessary pain or suffering. It is also a crime under this law for a person to fail to adequately care for a pet, including not providing proper food, shelter, water, air, protection from weather, and proper veterinary care. Many defendants that are charged with this misdemeanor have multiple pets and can be charged with more than one count. Although abuse or neglect of an animal is a misdemeanor with a low maximum jail sentence, it is still an extremely serious crime that can permanently scar a person’s criminal background. Further, a conviction may result in mandatory court ordered psychological counseling. The court may also order counseling for anyone convicted under the dog fighting or cockfighting laws. Contact the firm anytime to discuss possible defenses to your case, and let us start fighting for you immediately.